47th Annual ACM Awards: Sunday night live commentary! 959pm I like her with straight hair. 957pm Taylor Swift. Good job Tay Tay! 953pm He jokes about his “real shocked face” and looks at Taylor. Got her! 952pm The award goes to Blake Shelton. He better thank “The Voice”! 951pm Taylor Swift comes out to present Male Vocalist of the Year. I love when Taylor has straight hair. 950pm Personally I wouldn’t mind if this show ended, 3 hours is just way too long! 947pm Oh, first Luke Bryan performs his unsettling song “I Don’t Want This Night To End.” Something about it makes me want to change the channel. Not sure if it’s the words, music, the dancing, or D all of the above. else. 941pm Coming up, Male Vocalist of the Year and Entertainer of the Year. 940pm or was it Blake Shelton’s ex-wife? 939pm or was it Kenny Chesney that busted through the door and said that? 938pm Minister asks if anyone wants to object, speak now or forever hold their peace… Randy Travis busts through the door and says, “Don’t do it!” Kidding. 938pm They have a unity candle. Besides rings, that’s gotta be the most common wedding tradition. 937pm Although I do like this song, even if The Bachelor kinda ruined it for a few months. 936pm This feels weird. I can’t tell if this is sweet, or very odd. 935pm The ceremony starts featuring the song “Marry Me” by Train and Martina McBride. 926pm After the break, a wedding ceremony. This ought to be interesting. 924pm Dierks Bentley is a cool guy. He’s got 2 dogs, so that makes him even cooler. 922pm For anyone who doesn’t get the hype of the Zac Brown Band, how do you think that performance was? 920pm Brad Paisley joins them on stage and shreds the guitar. 918pm Zac Brown perform a fun upbeat song called “Whiskey’s Gone.” I love these guys! 917pm What I wrote at 830pm (below) didn’t actually happen. 914pm Blake Shelton introduces Miranda Lambert, performing her latest hit “Over You.” The song is good, and I’ll add that the music video is hauntingly awesome. 912pm Anyone remember the movie “Dangerous Minds”? I like that movie. 910pm I think I want to see Titanic in 3D Wednesday, if for no other reason than to see Jack shaking in the freezing cold water, in 3D-D-D-D-D-D! That’s my teeth chattering in the cold water. 908pm (central) Miranda Lambert wins Female Vocalist of the Year. 9pm Cheerios. As in, that’s what I’m eating. Be back soon. 856pm Guess what, more commercials, but did I just hear them say they’re going to show a real wedding after the break? That’s a first. 855pm If you’re watching the ACM’s, chances are you are fully aware how country you are, but if you are still denying your country roots, check here to see if you are more country than you think. 851pm Marc Anthony takes the stage? He introduces Sara Evans. 850pm Looks like everyone on the crowd has a red solo cup and you know who is so happy about this whole performance? The Solo brand. They may even send Toby a gold Solo cup. 849pm Carrot Top shows up and the crowd laughs along. 847pm Toby Keith performs “Red Solo Cup” if you can call singing that song a performance. He also just said testicles on national TV with no edit. 845pm I like Rascal Flatts. Funny guys and they seem to have good hearts/compassion for people. 843pm Rascal Flatts performs their new song “Banjo” featuring Steve Martin (yes, that Steve Martin) on the banjo. I like this song, but I thought it was meant more for a group like Little Big Town. 842pm Standing Ovation. Taylor warms up her Oh-my-gosh face. Other people clapping. 842pm Blake and Reba take the stage again and reflect on the life of Earl Scruggs who died earlier this week. 841pm One day I’m going to invent something where we can record TV programs then fast forward through the commercials. 838pm Another tease that Bono is coming up. Nothing screams country like an Irish rock star. 837pm Scotty thanks a long list of folks, never even mentioning Josh Turner, the guy who’s voice he stole. 836pm Alright I’m back. The Kimberly Perry Band presents new artist of the year award, going to Scotty McCreery. 835pm I have a hypothesis: the word redneck will always be popular in country music. 833pm You know what’s delicious? Seafood. Baked fish filets from the Gulf of Mexico = better than your dinner I bet! 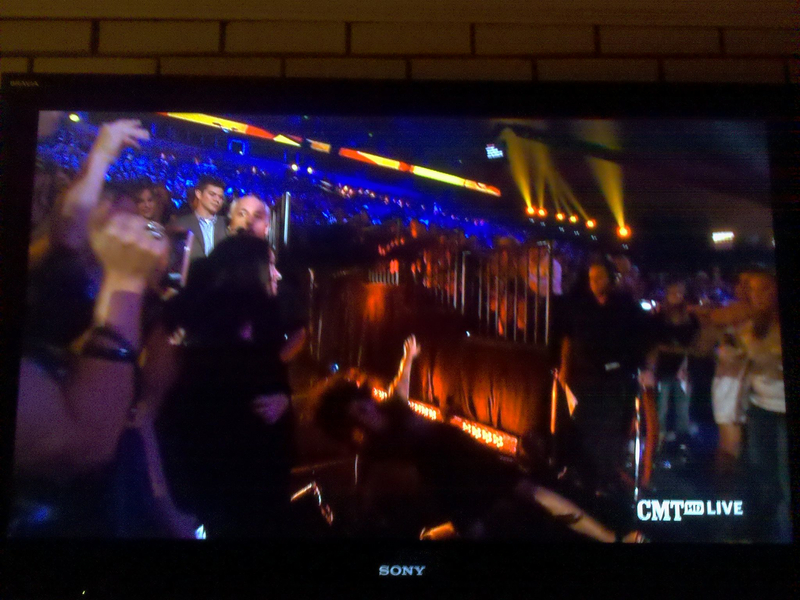 830pm Mickey Mouse rushed the stage and tackled Carrie Underwood. Crazy, right? 826pm Time for dinner. Take a break and I’ll be back in a short while. What will happen while I’m gone: more jokes, random guest presenters that probably have never listened to country music, and a random performance from an artist who’s got a new album or single coming out. Yes, I’m talking about Scotty McCreery. 825pm Can’t figure out this band out, they sing this song and a song about being taking things slow (“Just A Kiss”) but they also have a song “Lookin’ For A Good Time” about a one night stand. Hashtag confusion. Hashtag make up your mind. 821pm Blake and Reba (who are hosting) come up with a few more jokes, this time including Lindsay Lohan. Blake Shelton admits he screwed up the JetBlue joke but it was still funny. 820pm Jason and Kelly come up to accept the award. Kelly is looking fab. 819pm Jake Owen and a pencil present Singe Record of the Year. 817pm I really want to eat pizza right now. If you wanna send one over, message me and I’ll send you my address. 812pm Commercial break and the announcer is extremely intent on pronouncing every single syllable. His elementary teachers would be so proud. 811pm One could argue that Von Dutch hasn’t come around the first time yet. 811pm Or has it been so long that Von Dutch is coming back around? 810pm Evidently it’s 2003 because he’s got a Von Dutch hat on. 810pm Eric Church is wearing his signature baseball cap and aviator glasses. 809pm One of my favorites, Eric Church, takes the stage back at the MGM. He performs “Springsteen.” Guess what that songs about! Elvis. 808pm Looks like Brantley’s got some new tattoos. 806pm None of the members of Lady Antebellum actually kissed KISS. Well played. 805pm Award goes to Lady Antebellum. 801pm The music video for this song was filmed at the same location as his song “Tattoos On This Town”… an airport just outside of Nashville. 759pm Blake Shelton wins the crowd over with a joke or two, then Reba introduces Jason Aldean.